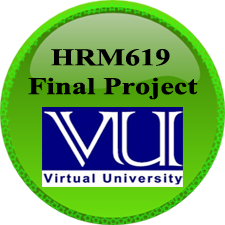 VU HRM619 Final Project – Recruitment & Selection Procedure, HR Trends of Pakistani IT Industries, T otal Quality Management, Job Satisfaction of employees, HR Implications in Private Banking Sector, Quality Circle, Importance of Training & Training Methods, Workman’s Performance Appraisal, Training & Significance of Job Analysis. Comparative study on the factors of job Burnout in Ufone and Telenor Companies. Personality Traits and Their Relationship with Organizational Commitment at HIRA Terry textile mills LTD.
Impact of training, Recruitment and selection practices on job satisfaction at Soneri Bank. Our professional and extensively experienced writing service offer HRM619 MBA Final project-Human Resource Management for the Virtual University of Pakistan. We assist students in writing their HRM619 Project Human Resource Management with 100 % project approval guarantee.